Sunshine Daydream' is a beautiful home located south of 'Scenic 30-A' in Summer's Edge, a beachside community in Seagrove Beach, Florida. 'Sunshine Daydream' is just steps (75 yards) from the powdered sugar white sand beach over a private walk down. Two private pools are also available. 'Sunshine Daydream' is just 1.8 miles from the town of Seaside, located halfway between Destin and Panama City. The community is just minutes away from shopping, restaurants and many other activities in Seaside, Watercolor, Rosemary Beach, Destin and Panama City. There are great bike paths, lakes and state parks, not to mention the Beach, nearby to provide plenty of outdoor activities. First Floor: 'Sunshine Daydream' is a professionally decorated four Bedroom, four and a half bath home designed to sleep ten to fourteen and is perfect for two families or a group of friends. It features three bedrooms, all with king size beds, and a kids bunk room that sleeps four. There is additional sleeping for four, two on a sleeper sofa and two in the tower day bed. The first floor is very open and includes a large fully equipped gourmet kitchen with white carrera marble countertops and stainless appliances. There is seating for eight at the dining room table while the counter has seating for four more. The spacious living area includes a slip covered sofa, linen rocker, and banana leaf table and chairs. The full entertainment center has a 32 inch TV, DVD, VCR and surround sound. There are hardwood floors throughout the first floor. Finally, relax to music or the ocean on the large front porch. 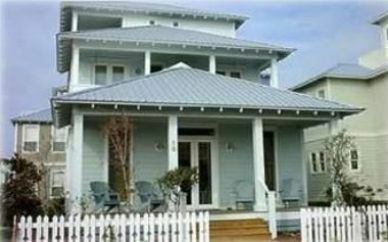 Second Floor: The second floor has two bedrooms with king size beds that open to a deck with two porch swings to enjoy the ocean breeze. There are two full baths with a half bath that is available for the kids bunk room. Third Floor: Finally the large third floor tower has a large living area, including TV, DVD, VCR, Stereo, a wet bar, full bath and an incredible porch with gorgeous views. All bedrooms (except bunkroom) have ceiling fans, Cable TV, and ample closet space. There is a washer and dryer, outside shower, high speed wireless internet and a Weber gas grill. The location, furnishings and amenities make 'Sunshine Daydream' a highly sought after home. My wife Sheri and I (Hank) live in Alpharetta, Georgia where we raise our 3 children. We knew someday we wanted to retire at the beach somewhere which led our journey to build Sunshine Daydream. The name of our home came from a song. We felt that it made the home perfect. Owned by Hank Allen and Sheri Allen of Alpharetta, Ga.
We 1st vacationed in the panhandle area in the 80's after we met. We loved the beaches and looked at property every year. Many times we came close to buying, but could never do it. We finally found this lot in the Summer's Edge subdivision and knew this was it. We designed and built this home for families like ours. See video on distance from beach and pool. What a beautiful, comfortable home! We would definitely recommend this property. There was plenty of space and privacy for our two families. The children enjoyed the bunk room and short walk to the beach and pools. The neighborhood was clean and kid friendly. This was our first visit to Seagrove Beach, and we were very impressed with the area. Our family is in love with Sunshine Daydream! My family first stayed at Sunshine Daydream when it was brand new. Our 2nd stay was May 2011 for about a week. We enjoy this home so much we are now looking at purchasing in the neighborhood! The layout of the house is perfect. Spacious, open, functional. The house easily accomodated My wife and I, Mother-in-Law, Daughter-in-Law and three grand kids, and my youngest son and his new bride. They all had a blast! There were separate bedrooms and bath rooms for all. Privacy was great for the newly weds, mom-in-law, and the wife and I. The kids have a perfectly designed room for them with large built in bunk beds that could accomodate 4 little ones or adults. The upper room worked great for our daughter-in-law and a terrible 2's grand daughter. A pull out roller bed right beside mom was just the ticket. An adult also could sleep on the pull out bed. We started each day getting everyone fed before heading to the beach. That was easy with the fully furnished kitchen. I'm an early riser so I'd be up and about watching news, reading the paper, and using the wireless internet, handling work stuff, emails, trading stocks before the rest of the gang came to life. After getting a jump on the day I'd have the coffee brewing and breakfast cooking for little hungry mouths when they come walking into the living room/great room area with mom close behind. Then it was off to the beach! The unit has a storage room with a beach cart great for hailing beach umbrella's, buckets, shovels and sand toys, floaties, rafts and other necessities for roughing it in the gorgeous white powdered gulf sand. A right turn out the front door and minutes later you are in paradise. Best beach in Florida. Family oriented, not crowded, spacious.. When the thirst for sun and surf was satisfied, we'd head back for lunch, get a nap in for the kids, cool down and relax under the decorative fans in each room. The balconies and views are spectacular! Swings, furniture, a great breeze. Only thing missing is you and a cool refreshing drink! Afternoon was POOL TIME. We'd grab the rafts, tubes, noodles, enjoying either of the two great pools with lounge chairs, tables, umbrellas, bath rooms. G-ma and G-pa swam until the kids were water logged, and everyone was ready for dinner. The unit has a Weber Grill we used for steaks, sea food, burgers and dogs. Sometimes we'd load up the gang and do dinner at great local restaurants instead. Thank You for the positive review. We are happy that our home met your needs! A last minute Easter break getaway brought us to this wonderful home in Seagrove Beach. Sunshine Daydream had everything our family of 5 could need or want. We were looking for a warm and relaxing vacation to share some family time together after a long cold midwest winter. One of the most beautiful beaches in Florida just steps away, a choice of 2 pools, one perfect for our younger daughter and bikepaths to nearby Seaside just out the door, we couldn't have been happier with our vacation rental home. Sunshine Daydream is a very clean and comfortable family friendly home that sits on a quiet loop street that lets the kids walk safely to pools and beach. Morning coffee on the front porch, a game of cards and sunsets from the tower deck were a perfect start and end to our days at the beach. My family couldn't imagine a more perfect place to stay in Seagrove Beach or Florida for that matter. My youngest daughter said it perfectly," Can we stay here always?". We will definitely find our way back to Sunshine Daydream. Thank you for helping us make some unforgetable family memories. Our family loves Sunshine Daydream! We have stayed here several times and it's wonderful. Very upscale but comfortable. Furnishings obviously professionally decorated. White Marble in kitchen and bath rooms. Lots of decks and space for multiple families to spread out. Great front porch and house is wired for music. 3 Master Bedrooms, a bunk room, and a loft. Literally steps from the beach, no crossing any roads, easy with even a stroller. 2.5 mile bike ride to Seaside which means older children can explore on their own. Lots of bike trails to neighboring communities. The house comes with the use of several bikes. We love it! decorating and top of the line appliances. 3.5% DISCOUNT for cash/Check. 11.5% DISCOUNT WHEN BOOKED THROUGH OWNER Please Call or email for other time periods. Rates subject to change. Booking deposit required. Sorry, no pets. Parking for 2 cars only. House Linens provided. Bring own beach towels. Must bring your own beach towels. Travel/Hurricane insurance Available Call now for long term Winter Rates.